"When I was in Grade 3, my teacher had our class make these...my mom copied the recipe, and I have hung on to it ever since!" 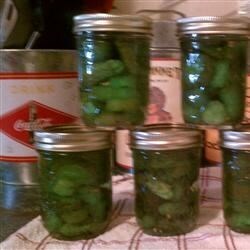 Day 1: Place the cucumbers into a large (10-quart) jar or pickle crock. Stir the pickling salt and 16 cups of water (or as needed to cover the cucumbers) into a large pot, and bring to a boil over medium heat, stirring until the salt is dissolved. Pour the boiling salt mixture over the cucumbers, and cover the crock with a cover or dinner plate. Days 2 and 3: Stir the pickles and brine once each day. Cover the crock each time. Day 4: Pour off the brine. Bring 16 more cups of water to a boil, and pour the boiling water over the pickles. Cover. Day 5: Pour off the water from the pickles again, and bring alum and 16 cups of water to a boil. Stir until the alum is completely dissolved. Pour the boiling water-alum mixture over the pickles. Cover. Day 6: In a large pot, boil 16 more cups of water with the sugar, pickling spice, vinegar, and food coloring. Pour the water-alum mixture from the pickles and discard, and pour the boiling sugar mixture over the pickles. Cover. Day 7: Pour off the syrup from the pickles, but retain the syrup. Transfer the syrup into a large pot, bring to a boil again, and pour over the pickles. Cover. Day 8: Pour off and retain the syrup again, and transfer into a large pot. Reboil the syrup over medium heat. Sterilize the jars and lids in boiling water for at least 5 minutes. Pack the pickles into the hot, sterilized jars, and pour the boiling syrup in, filling the jars to within 1/4 inch of the top. Run a knife or a thin spatula around the insides of the jars after they have been filled to remove any air bubbles. Wipe the rims of the jars with a moist paper towel to remove any food residue. Top with lids, and screw on rings. Place a rack in the bottom of a large stockpot and fill halfway with water. Bring to a boil over high heat, then carefully lower the jars into the pot using a holder. Leave a 2 inch space between the jars. Pour in more boiling water if necessary until the water level is at least 1 inch above the tops of the jars. Bring the water to a full boil, cover the pot, and process for 15 minutes. Remove the jars from the stockpot and place onto a cloth-covered or wood surface, several inches apart, until cool. Once cool, press the top of each lid with a finger, ensuring that the seal is tight (lid does not move up or down at all). Store in a cool, dark area. See how to make easy bread and butter pickles from scratch.